As a Boeing Delta 2 rocket successfully lofted a new U.S. Air Force navigation satellite on Sunday, two onboard video cameras provided dazzling views of the predawn jaunt into space. The popular "rocketcams" are becoming a more frequent treat to space fans and Sunday's show was even more special, marking the first nighttime launch to feature the onboard cameras. Engineers have been installing the cameras to gain new insight into how parts of rockets actually perform during flight. "Everytime we learn more," said Rick Arvesen, Boeing's chief Delta engineer. The Delta 2 on Sunday was outfitted with a pair of cameras facing downward, positioned 180 degrees apart, on the second stage's miniskirt ring where the stage attaches to the interstage structure. The action began as the "rocketcams" showed the burst of fire when the first stage main engine and vernier steering jets came to life, followed a split second later by a blast of smoke and light as the six solid rocket motors ignited. The Delta was on its way, screaming from Cape Canaveral Air Force Station's pad 17A along Florida's eastern coast at 5:17 a.m. EDT (0917 GMT), or 80 minutes before sunrise. Because of the overpowering light from the rocket's exhaust plume, the ground quickly disappeared into the blackness of night. But viewers could see the Delta 2 go supersonic and solid boosters propelling the rocket miles into the sky. Just over a minute into flight, the six solids ignited on the launch pad consumed all their propellant and were jettisoned, which was captured in spectacular fashion by the "rocketcams". The remaining three air-started solids were started, continuing the Delta 2 rocket's push to orbit. They were jettisoned over two minutes after liftoff, also seen clearly in the downlinked video. 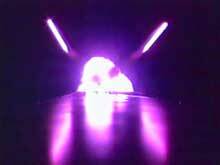 Delta then edged closer to leaving the atmosphere on just the power of the liquid-fueled first stage main engine. About 4 1/2 minutes after take off, the first stage engine cut off and the spent stage separated to fall back to Earth. The second stage engine then ignited, blasting the spent first stage, and the rocket's nose cone was jettisoned as the Delta began moving toward sunrise above the Atlantic Ocean. The live video signal was lost a few minutes later at Cape Canaveral as the rocket passed out of range from a tracking station. The Delta rocket, the 279th launched since 1960, continued its 25-minute long flight without difficulty. The third stage successfully deployed the U.S. Air Force's NAVSTAR Global Positioning System 2R-5 navigation satellite into a highly elliptical transfer orbit around Earth. The GPS craft is also known as Space Vehicle No. 44. The $44 million spacecraft, slightly more expensive than previous Lockheed Martin-built sister-satellites because of some upgraded components, will maneuver itself into the Air Force's GPS constellation in the coming days. Officials expect the craft to be checked out and ready for service in the next 30 to 45 days, becoming an active member of the orbiting network used to provide precision location and timing information to U.S. military troops and civilians around the world. The GPS constellation is comprised of 24 primary satellites divided into six orbital planes with four spacecraft in each. They circle in formation about 10,900 nautical miles above Earth every 12 hours in orbits inclined 55 degrees to the equator. 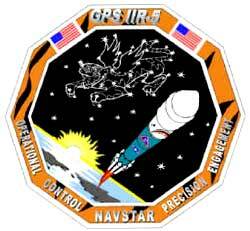 Controllers plan to place the new GPS 2R-5 satellite in Plane B of the constellation. The craft will actually assume a new slot in that plane -- Slot 5, essentially expanding the fleet without replacing any older satellite. What could be considered an insurance policy of sorts, the Air Force wanted to have the new satellite already in space when one of the four older GPS craft in that Plane should each the end of life. In the future when an older one fails, GPS 2R-5 will be maneuvered into that satellite's slot. The four satellites in Plane B were launched in 1989, 1993 and 1996. "This launch will not immediately replace any single satellite," the Air Force said in a statement. "It is being launched to add constellation robustness and will be positioned as best suited to meet future constellation needs." There are 28 GPS satellites currently in operation, not including GPS 2R-5. However, 16 have lost redundancy in onboard systems and exactly half of the fleet -- 14 satellites -- has surpassed their 7-1/2-year life expectancy, the Air Force says. The ongoing deployment of GPS Block 2R satellites, built by Lockheed Martin, is aimed at keeping the crucial navigation system functioning for years to come. It was the 33rd GPS satellite launched by Delta 2 rockets since 1989 and will be the 29th operational spacecraft in the constellation. 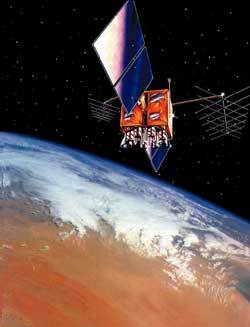 Three previous satellites have failed in space and one was destroyed in a 1997 launch failure. Sixteen more GPS Block 2R spacecraft -- the latest generation -- are due to be launched through 2005 by Delta 2 boosters, keeping the constellation replenished as older satellites reach the end of their useful lives. Everyday, GPS guides U.S. military troops, aircraft, submarines and ships around the globe. Troops also relied on the system extensively in the featureless desert battlefield of the Gulf War. Weapons can use GPS data for guidance. GPS also found its way into the civilian commercial market - assisting planes, automobiles, boats, hikers and map makers. Sunday's launch was delayed one month after Boeing engineers encountered a problem fitting together the first and second stages of the rocket atop pad 17A. The two stages are joined together by the interstage structure -- a hollow cylinder that remains connected to the top of the first stage during launch and encloses the second stage engine. The interstage was replaced twice but without solving the alignment problem as the second stage and interstage did not come together evenly across the rocket's 8-foot-wide diameter. The alignment was off by as much as three-eighths of an inch around the diameter with the top-end of the interstage more oval than perfectly circular. A paperwork trace determined both problematic interstages were built and shipped at roughly the same time, suggesting perhaps a manufacturing glitch. A third interstage was brought to the launch pad and successful joined the first and second stages in late June, allowing pre-flight assembly to resume for the Delta 2 rocket. The two faulty interstages have been returned to Boeing's plant in Pueblo, Colorado, for detailed inspections as an investigation continues into the problem, said Boeing Mission Director Rich Murphy. Murphy said Friday that the incident indicates the hardware screening process used at the factory needs to be improved to ensure faulty rocket parts aren't shipped to the launch site in the future. 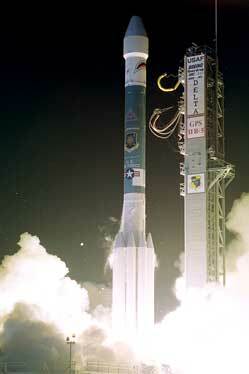 The Boeing Delta 2 rocket lifts off from pad 17A carrying the GPS 2R-5 satellite for the U.S. Air Force. A video camera mounted on the exterior of the Boeing Delta 2 rocket's second stage shows the view of ignition and liftoff from Cape Canaveral. The Boeing Delta 2 rocket's three air-lit solid rocket boosters are ignited and the six ground-start motors are jettisoned as seen from ground. 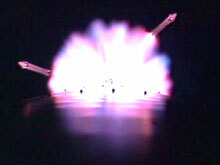 Onboard camera shows the air-lit solid rocket boosters igniting and the six spent ground-started motors being jettisoned. Onboard camera shows the spent air-lit solid rocket boosters being jettisoned and the first stage main engine still firing. 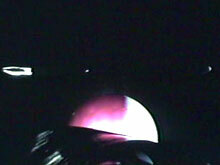 Onboard video camera shows the spent first stage separating, second stage engine start and fairing jettison. Download QuickTime 4 software to view this file. Launch site: SLC-17A, Cape Canaveral, Fla.
Orbit trace - A map shows the launch track for the mission. Delta 2 - Official Web site of Boeing's Delta 2 expendable launch vehicle program. GPS - Global Positioning System Joint Program Office at U.S. Air Force. LMMS - Lockheed Martin Missiles & Space built GPS 2R-5. 1st Space Launch Squadron - Oversees Delta rocket launches and facilities at Cape Canaveral Air Force Station in Florida. History of Delta - A private Web site devoted to past Delta launches with valuable facts and figures.